C-Teams valuable to our students. The world’s most successful companies are run by teams, and our program makes you part of a winning one. From the beginning of the Executive MBA program at Vanderbilt, you’ll be assigned to a cross-functional C-Team of peers who brings skills and experience that are complementary to yours. As part of this team, you’ll complete much of your work in the program, including the Capstone Strategy Project in year two. In the process, you’ll become a more well-rounded leader by learning to see through the eyes of your peers and understand the challenges specific to their area of expertise. You’ll also acquire skills to enhance and improve your teams at work. Our graduates often say they learn as much from their C-Team as from their world-class professors. In a process that is part art and part science, we carefully design these teams to emulate a C-suite of executives with a complementary balance of backgrounds, so members of your team will represent the range of expertise you’ll find in a typical organization. Based on your job function and expertise, you’ll take the role within your team of someone in a corporate C-suite. 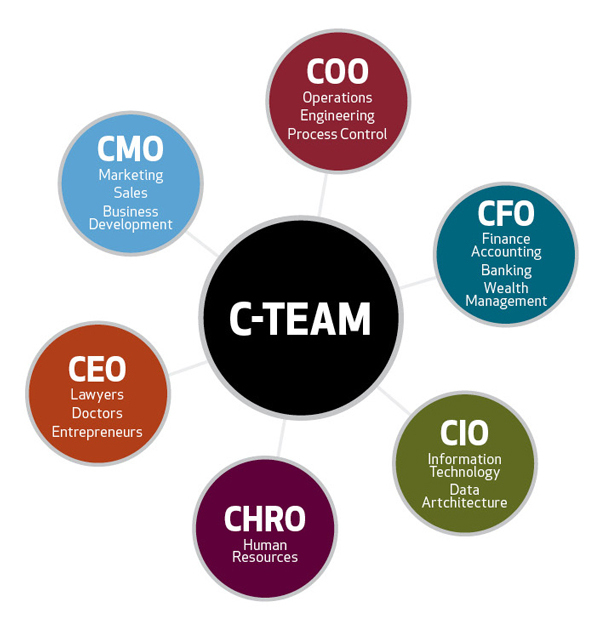 My C-Team consisted of five members with a wide range of experience (engineer, trader, IT, lobbyist and healthcare). We didn’t always agree, but it quickly became evident that respect and compromise would be integral to the success of our team, just as they are in the actual work environment.